Valencia Lakes Homes: Quality waterfront home with expansive views of 81 acre lake. Open concept, hardwood floors, renovated kitchen with huge island for entertaining. Master with lake and pool views, abundant closet space. Master Bath has dual sinks, granite counter, oversized jetted tub and walk in shower. Large Lanai opens to heated pool. Brand new roof and pool cage screening. Active community with clubhouse, pool, fully equipped gym, tennis, pickleball, and basketball. Low HOA fees. New Publix and CVS nearby. Valencia Lakes Homes: Exquisite home in one of Naples most desirable communities!! This home features 5 bedrooms plus a Den and 3.5 Bath, 2 car garage, pool, stainless appliances and it’s on a cul-de-sac!! Tile floors on 1st story, wood flooring on 2nd story, bathrooms have been fully upgraded with beautiful detail. Valencia Lakes is a great neighborhood with very low HOA fees, just minutes to everything, located in on of the best rated school districts in Collier County! This is an amazing opportunity to own your dream home in a great location, MUST SEE!!!! Valencia Lakes Homes: Beautiful two-story home with a lake view, fenced in backyard and landscaped for privacy in a gated community. It boasts 5 bedrooms plus Den and 4 bathrooms. Kitchen has corian countertops, wood cabinets and stainless steel appliances. Separate dining room, living room and family room. This home has NEW features: exterior paint, hot water heater, irrigation pump, carpet, 2 Air-Conditioning units and a NEW ROOF is under contract as well. The sliding glass door is hurricane proof, clear hurricane shutters for entire home, and hurricane screens for front and back lanai's. Screened front porch and lanai with a large extended paver patio, great for entertaining. Walking distance to Publix, and a perfect home for a growing family. Valencia Lakes Homes: Huge Price Reduction!! Gorgeous 5 bedroom, 3.5 bath, Formal Living & Family rooms, Formal Dining & Breakfast nook, Loft, two screened lanai and 2 car garage home on lake under $400,000!!! Don't miss the wonderful opportunity to own your dream home in Valencia Lakes, a gated community with very LOW HOA dues and direct access to new Public and CVS. This spacious home features formal living, formal dining, family room, eat-in kitchen with island, breakfast nook, two bedrooms with a common bathroom, laundry room with sink and a powder room downstairs with 24x24 tiles all over. Upstairs welcomes you with brand new carpet, a huge loft in the middle with split floor plan featuring huge master bedroom with private screened balcony, double sink master bath, large walking closet onside and two bedrooms with common bath on the other side. Higher-end kitchen appliances including a double oven range replaced in 2011. Downstairs AC replaced in 2017 and upstairs air handler replaced in 2011. Huge backyard with beautiful lake view has room for pool and party. Community features numerous amenities including the club house, community pool, basket ball and tennis courts, and onsite management. Valencia Lakes Homes: BRING OFFERS!! Immaculate 3 bedroom+den, 2 bath, 2 car garage home located in gated Valencia Lakes. This home is located on a corner lot with lake view and the back of the home and pool are totally private so you can enjoy your pool and spa. This home features crown molding, granite, new AC in 2015, new dishwasher in 2016, clear panel storm shutters and sliding metal shutters for the lanai area, an open floor plan, split bedrooms and more. Valencia Lakes has one of the lowest HOA fee structures in the County. We are adjacent to a new Publix, CVS, nail salon, Chinese Restaurant, and liquor store that can be accessed directly from the neighborhood thru a private gate that opens directly into the Publix lot. Never have to go out on the highway for shopping. You can also walk or bike. Valencia Lakes has AAA rated schools within walking distance and since they are designated storm shelters, we are some of the first to get our power restored. Valencia Lakes has a Club House, community pool, tennis court, sidewalks, underground utilities and streetlights. Valencia Lakes Homes: H.13788 - Curb appeal extraordinaire! This meticulously maintained, and significantly updated home features a professional landscaping package in both the front, as well as rear of the property. From the moment you enter through the double foyer doors, it becomes apparent that the home's floor plan flows beautifully. Most of the flooring in the home has been replaced with COREtec "wood look" laminate flooring. It's glamorous master bath has been completely renovated, featuring a spectacular, over-sized walk in shower. The master suites closets have been outfitted with custom shelving. Many custom decorator touches are evident throughout the home. The outdoor living space is completely private, with a lush lawn for activities. The over-sized screened enclosure features upgraded quality screening. This popular community boasts many terrific amenities, including a Pickleball/Tennis/Basketball court, an updated fitness center, and three Gated Entrances/Exits. Low HOA Fees are a hallmark of Valencia Lakes along with the tremendous value it offers it's residents. There is a new shopping center bordering Valencia Lakes offering a proprietary residents entrance into the community. Valencia Lakes Homes: ***PRICE TO STEAL! *** A serene single-family home in a beautiful gated community! Located on a cul-de-sac street providing peace and lots of space for privacy. With an amazing value for over 2600 sq ft. living space, it currently offers the LOWEST PRICED POOL HOME in the neighborhood. This grandiose home presents 4 bedrooms, 3 full baths and a half bath. The generous master bedroom exhibits an on-suite master bath with a soaking tub and a walk-in shower together with an immense walk-in closet and additional office space. The guest room offers an on-suite bath and a walk-in closet that would make even the most particular of guests feel right at home. The vibrant open floor plan also exhibits an oversized kitchen with a breakfast nook, Corian countertops, “42 cabinets and a separate dining room which opens to the family rooms. The extended lanai features a beautifully caged pool overlooking the lakeside. Extensive 2-car garage with a 200 watt plug and is pre-plumbed for a sink. The community offers amenities such as upgraded clubhouse, gym equipment, heated resort style pool and tennis/basketball/ pickleball courts with really low HOA fees! Within walking distance to Publix and CVS. Valencia Lakes Homes: LOW LOW LOW HOA FEES!!! LIVE IN A MANICURED COMMUNITY WITH CLUBHOUSE, RESORT STYLE POOL, FITNESS CENTER & TENNIS COURTS WITHOUT THE HIGH FEES! THE LOW $130.00/MONTHLY FEES EVEN COVER YOUR WATER IRRIGATION! Totally Renovated Concrete Block Home with Granite Countertops in Kitchen Bathrooms, Stainless Steel Appliances, with Travertine and Tile Flooring throughout the Entire Home! Home offers an Open Floor plan Design, High Ceilings, a Split Bedroom Floor Plan and comes complete with New A/C Systems (3 years old), Accordion Hurricane Shutters throughout Entire Home, a Large Brick Paver Driveway, a New Irrigation System and the Most Coveted Landscaping Package! Home Offers an open Floor plan with Split Bedrooms, a Formal Living Room/Dining Room and a Large Family Room off the Open kitchen with Built in Desk and separate Breakfast area, Family room opens up to Lanai and beautifully landscaped private backyard with Fruit trees including Mango, lemon trees! Valencia Lakes Homes: Situated in the gated community of Valencia Lakes, this original owner home is not one to be missed! A paver stone driveway accentuates the exterior while the natural lighting greets you as you enter the home. Dual sliding doors give you access to the screened in paver lanai, from the living room and the master bedroom. Views of the lake are to be had from majority of the home, adding to the tranquility of this location. The kitchen features granite countertops that add a touch of luxury to the culinary experience while the open concept allows for ease of entertaining. Many amenities are to be enjoyed in the community and are included in a very reasonable HOA fee. Come see today where you could be living tomorrow. 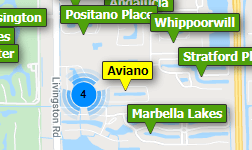 Need professional assistance selling your property at Valencia Lakes Naples? Find out how an Area Specialist can help to generate more property exposure in order to get the most money for your investment in the least amount of time.